Dock two of your 2.5" and 3.5" SATA drives over high performance USB 3.1 Gen 2 with UASP. 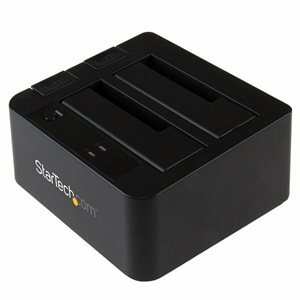 Get unprecedented performance and storage capacity with this USB 3.1 Gen 2 (10 Gbps) dual-drive docking station. It supports both 2.5" and 3.5" form factor solid-state and hard drives, with a high capacity storage capability of 12TB (6TB per drive).USB 3.1 Gen 2 gives you greater bandwidth and speed with file transfer rates of up to 10 Gbps - twice the speed of USB 3.0 (USB 3.1 Gen 1) technology. It lets you leverage the high performance of the latest SSDs and hard drives, while alleviating bottlenecks in your data transfers.It's never been easier to dock and swap drives from your desktop computer or laptop. Simply insert your drives into the top loading slot, with no tools or trays required. The HDD ejection button allows fast and simple drive removal.The dual-drive docking station comes with a USB Type-A to B cable, providing backward compatibility with your existing USB 3.0, 2.0 and 1.x devices. It also supports UASP for enhanced performance.Extend the value of this hard drive docking station further with the addition of our SATA to IDE Hard Drive Adapter (SAT2IDEADP), allowing easy insertion of any 2.5" or 3.5" IDE hard drive into a SATA hard drive dock.